Gene Luen Yang began making comics and graphic novels over fifteen years ago. In 2006, his book American Born Chinese was published by First Second Books. It became the first graphic novel to be nominated for a National Book Award and the first to win the American Library Association’s Printz Award. It also won an Eisner Award for Best Graphic Album – New. In 2013, First Second Books released Boxers & Saints, a two-volume graphic novel about the Boxer Rebellion. Boxers & Saints was nominated for a National Book Award and won the L.A. Times Book Prize. He has done a number of other comics, including Dark Horse Comics’ continuation of the popular Nickelodeon cartoon Avatar: The Last Airbender and DC Comics’ Superman! 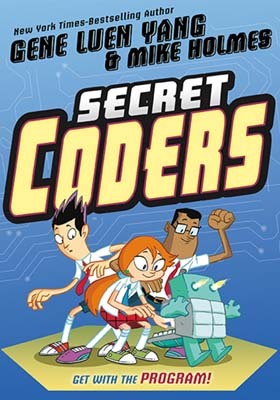 Gene is currently creating a series on coding starting with Secret Coders Book 1! He wrote the code for his dot! Learn more about Gene Luen Yang on his website.